Free to Play Road Assault 2, start your free game now (2016). 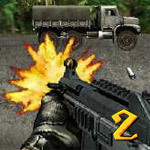 Description: Defend the base car the second edition, more powerful enemy, of course, you also get more powerful weapons! Strictly enforce the order, to protect the base car out of danger!